June Lakes offers diverse eating options that are unique to the Eastern Sierra. June Lake eateries offer everything from Classic Steak and Seafood, Hawaiian, Mexican and Pizza. this guide will help you with your options in June Lake. Enjoy Rustic Mountain Ambiance while dining at Carson Peak Inn. Located two miles from the village, Carson Peak offers American Fare: seafood, steak, and chicken. With Nostalgic music playing and dim lighting, dining here reminds one of a time where dining was an evening event. Locals pick: Bar-B-Q Back Ribs Hawaiian (Pineapple Sauce). 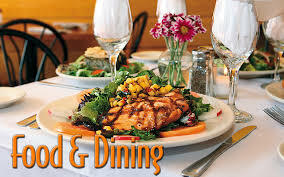 Eagles Landings Restaurant- Breakfast, Lunch and Dinner. Eagles landing offers a casual atmosphere in June Lake. The décor is Upscale Mountain mixed with old west. Seating is comfortable with large booths and a fireplace in the dining room. The bar has flat screens for catching your favorite game. Locals pick: Grilled Atlantic Salmon (Lemon Dill). Trout Town is located in the village. Offering Mexican food along with morning Fare. This is the best Mexican food in town. The coffee shop itself is quaint, only a few tables. It is fun to enjoy coffee and watch the town happenings. Locals pick: Tacos (Carne Asada). JLB is a locals and visitors favorite. Relax in the tasting room after a long day of fishing, hiking or skiing. The patio is comfortable on a summer day. Beer is also available to take back to your cabin or campsite. Nothing is better than a quiet evening drinking JLB beer. Locals pick: The Huitte Double IPA and Deer Beer Brown. Located at the 395 and 158 junction inside the shell gas station one can find almost anything needed for hitting the road. This Deli style kitchen serves breakfast burritos, hot dogs and sandwiches. Don’t forget water, drinks and snacks for your day. Located adjacent to June Lake Brewing, Ohanas 395 offers Hawaiian food such as a plate lunch or savory loco moco. The specials change daily, things like ahi poke, fusion tacos, stacked hamburgers, sushi hand rolls, rice bowls, and even a loaded quesadilla. Ohanas is a food truck so you order and food is packaged to go. Locals pick: The tacos “Christmas” style. Boasting the second liquor license issued in California, the historic Tiger Bar has a long and event filled history. A must when visiting June Lake. The wood floors are original. Food is American with some Mexican mixed in. A locals hang out with music always playing on the Juke Box. This classic restaurant is great for a relaxing meal. The pizza is a great choice for dine in or take out. Also a fun place to go on holidays like Halloween and New Year’s Eve. The often features live music or a DJ. A Locals favorite is the Silver Lake Cafe located on the shores of Silver Lake. This is the only dining option with Lake Views, get there early, the dining room is often full from open to close. Silver Lake Resort once named Carson’s Camp and built in 1916 makes it the oldest resort in the Eastern Sierra. Breakfast has everything you could want and the best biscuits and gravy you can find. Lunch offers fresh salads, sandwiches and burgers. Locals Pick: The Garbage omelet.